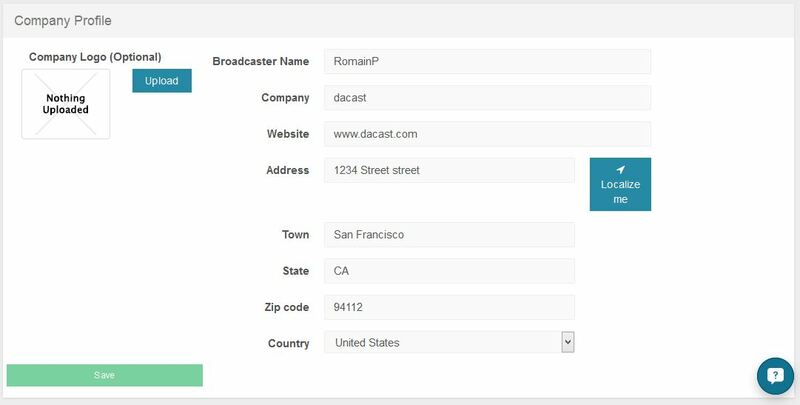 There are two places to upload a logo to your DaCast account, one is global (company) and one is on a per channel/file basis. To upload click and browse for a picture file on your computer. Square images are the best, although other sizes can be used. Images can have transparent elements (PNG or GIF). On all live channel and video on demand content, there is also the ability to upload a unique logo for that content. This is found under DESCRIPTION for both types of content. Click UPLOAD to add a new logo. If a logo is already uploaded, it will display an image. If you have uploaded a logo under COMPANY PROFILE, that will be used as the “default” logo here unless a new one is uploaded. This logo can be used for watermarks, depending on how the player theme is set up. 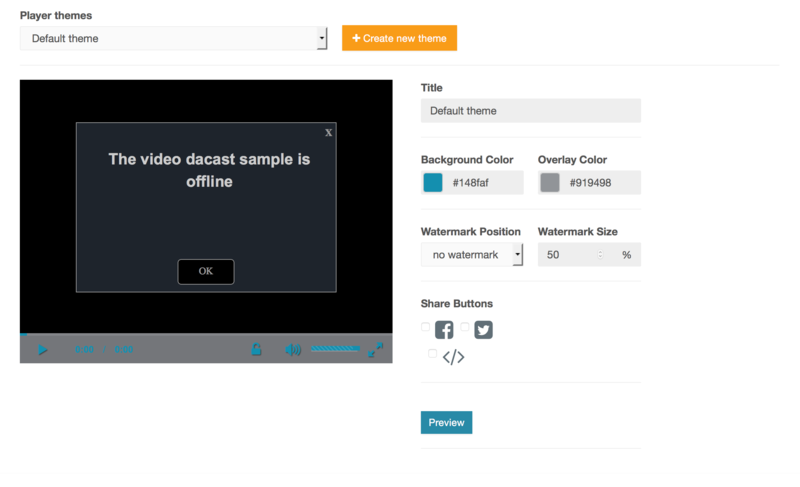 To start using a watermark, you need to first create a player theme. To do this, click . This will bring you to an area to create and edit player themes. 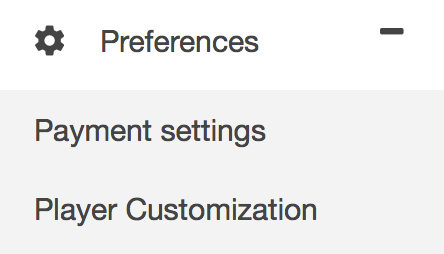 Part of this is the option to select a . The options are Top Left, Top Right, Bottom Left and Bottom Right. The final step to attach a Player Theme, and therefore a watermark, is to pick the channel or video and go to . One of the options is to choose what player theme you want for your content. 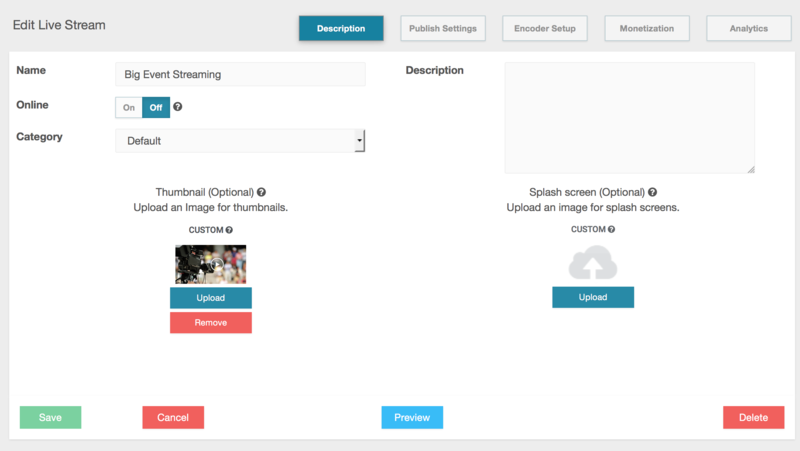 If you have a lot of content, you can setup a default theme that’ll be used for newly created channels. Note: selecting a Default Theme does not change already existing live channels and files.